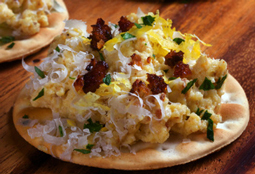 Egg and Bacon Bites on Lahvosh Crackers - A recipe from Savor California, the online showcase for extraordinary gourmet foods and beverages from California. Thanks to Chef Julia Conway, owner of Stella Cadente Olive Oil for the ideas for this recipe. Photo by Donna Turner Ruhlman. Boil the eggs. Peel and chop. Add green onions, salt and pepper, and just enough mayonnaise to bind together. Add fish sauce, if desired. Cook the bacon until crisp. Blot on paper towels and crumble. Fold into egg mixture. Using a microplane, finely grate Pecorino Romano cheese, and lemon zest. Pile the egg and bacon mixture onto the lahvosh crackers. Top with a sprinkle of cheese and lemon zest.